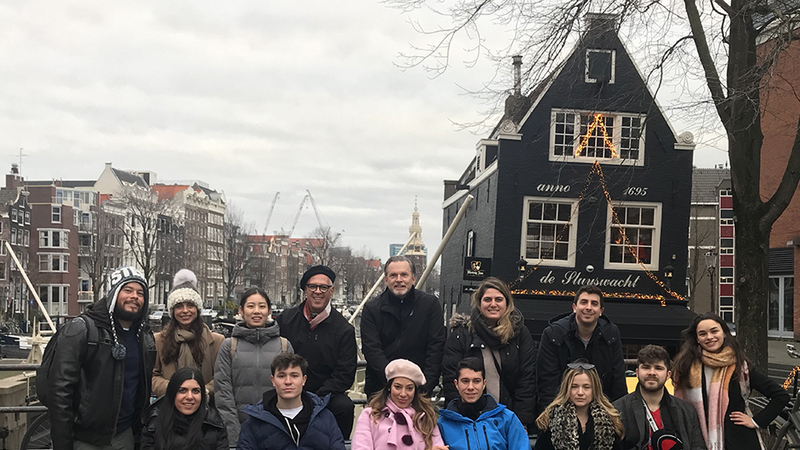 An interdisciplinary group of 12 students from a variety of undergraduate and graduate programs at the University of Miami, including Architecture, Real Estate, Engineering and Business, participated in a Winter Intersession Course in Amsterdam, Rotterdam, and Bruges. Associate Professors Dr. Charles C. Bohl and Jaime Correa lead a course focusing on traditional and contemporary urban design, architecture, and real estate development practices in the Netherlands - where more than 25% of the territory is man-made and lays below sea level. Students and faculty explored four of the most important periods in the history of Dutch urban development: the radial and picturesque urban structure in the cities of Amsterdam and Bruges, the non-secular Begijnhof Development settlements, and the traditional residential building types of the XVII century; the English Garden City adaptations in suburban areas of Amsterdam and Rotterdam; the modernist work of The Stijl, Berlage, J.P. Oud, and the School of Amsterdam; and, some of the most recent real estate developments in the City of Rotterdam and Amsterdam, including MarktHal and Silodam by MVRDV. Study Abroad Intersession courses provide opportunities to test theoretical knowledge in-situ, to broaden our understanding of new technologies and procedures in an age of globalization, and to have direct access to perceptual ideas which cannot be directly conveyed in the space of a classroom.